Srila Prabhupada: Jaya om visnu pada parivrajakacarya ....So we are thinking we are very much fortunate to hear His Divine Grace Om Visnupada Paramahamsa Parivrajakacarya Bhakti Raksaka Sridhara Maharaja. He is, by age and experience, in both ways he is senior to me. I am also always fortunate to have his association for a very long time -- perhaps since nineteen hundred and thirty or something like that. At that time, he did not accept sannyasa; he just left home, vanaprastha. In his white dress he went to Allahabad. (Aside, to Srila Sridhara Maharaja:) Maharaja, I think you remember this incident when you went to Allahabad. Srila Sridhara Maharaja: Yes, I do. Srila Sridhara Maharaja: ...we took prasadam on the roof. Srila Sridhara Maharaja: ...1920, but at the beginning of non-cooperation. Srila Prabhupada: No, I was in connection with Congress by 1917 when I became the Congress president. Then I became serious in 1920 and I gave up my education. So one of my friends...perhaps you know, Maharaja, that Narin Mandi...actually he was my intimate friend. So in their house old [Bhakti Pradipa] Tirtha Maharaja went to beg some alms, so he informed me that, "One nice sannyasi came to our house and he has invited us to go to Ultaganna there in the Gaudiya Math. So he has invited me, and I wish to go there. Why don't you come also? Let us go together." He was my very intimate friend, so at that time I was a little hesitant: "Why should I go? I know all the sadhus there; I am not going." But he forced me: "Oh, why not? Let us go." "Alright, let us go." So I went to see His Divine Grace Bhaktisiddhanta Saraswati Thakura in nineteen hundred and twenty-two in the Ultaganna building. At that time Guru Maharaja was sitting on the roof of a small house at noon. He was very kind, because the devotees saw that Lal Mandi was a very rich man and had contributed some money. So we went to see Prabhupada and to offer our obeisances, and immediately he said, "You are all educated young men. Why don't you preach Sri Caitanya Mahaprabhu's message throughout the whole world?" So because I was politically-minded at that time, I replied to him that, "We are a dependent nation. Who will hear our message? We can speak about all these things after we get independence." Yes. So he refuted my argument. That day I was defeated and I took his words very seriously; I appreciated him. Then we were offered some prasadam, we came down, and my friend asked me, "How did you like this sadhu?" I replied, "Yes, here is a sadhu in whose hands Caitanya Mahaprabhu's message is there, and it will be done. I think he was very nice." That was my appreciation, and then in nineteen hundred and twenty-three I resigned from my post as manager of Bose Laboratory and I accepted the agency of the whole of U.P. up to Delhi, and I made my head office in Allahabad. Still, I was always thinking, "Oh yes, I met a very nice sadhu." From the very beginning that was my intuition that, "I have met a real sadhu." So actually he was lava matra sadhu-sange sarva siddhi haya -- he was, actually. I could feel it, for a moment. I was so much impressed with Bhaktisiddhanta Saraswati Thakura. It continued. Then in nineteen hundred and twenty-eight, when there was Kumba Mela....Maharaja, when did you join Gaudiya Math? Srila Sridhara Maharaja: I was thirty when I met Prabhupada in August, 1926. That was my first meeting, and I joined the mission in May, 1927. Srila Prabhupada: In nineteen hundred and twenty-eight there was a Kumbha Mela, and at that Kumbha Mela [Bhakti Pradipa] Tirtha Maharaja with a party came to my shop. He said, "We are sadhus,"and I thought, "Oh, these are the people I previously saw." Srila Prabhupada: Yes, I was so glad. So Tirtha Maharaja requested me that, "We are new here, we have traveled here to attend the Kumbha Mela, and we have heard your name, so we have come to you. Please help us." I said, "Yes, I will help you." In this way I contributed to them, my attending physician contributed, and some other friends. In this way Tirtha Maharaja and I became friends, and he held his first program in Allahabad in my house with, I think, Sarvaisnava Brahmacari and Bir Krsna Brahmacari. Srila Sridhara Maharaja: Yajavara Maharaja. Srila Prabhupada: Yajavara Maharaja, yes. So my father was a Vaisnava, but when I invited the Gaudiya Math sadhus, my father thought that I have invited some sadhus from the Ramakrishna Mission, so he was not very interested. (Laughter) When Tirtha Maharaja was speaking, I called my father-at that time he was invalid-I called him, "Please come down, there is a meeting with the Gaudiya Math." So he could not resist my request; he came down, but he did not think that some devotees have come — he thought that, "These are Ramakrishna Mission rascals." Srila Prabhupada: So he was not very happy, but I told him, "While they are speaking, just sit tight." But when he heard the speech of our Tirtha Maharaja, our old Godbrother, he said, "They are Vaisnavas!" Then immediately after the meeting he fell down at his feet. [To Srila Prabhupada:] "I misunderstood what you said, thinking that he was a Ramakrishna sadhu. (Laughter) [To Tirtha Maharaja:] I am so glad to meet you." That is the beginning of my intimate relationship with the Gaudiya Math. And they kept coming, and whenever somebody would come, I would invite them to lecture in my house. In that way. Sridhara Maharaja — at that time, Ramendrasundara Bhattacarya — he was also invited to my house, and before that, I think I invited Bharati Maharaja and you were with Bharati Maharaja. Srila Prabhupada: Yes. So, in this way my connection became developed with the Gaudiya Math, and then gradually the process began: harisye tad dhanam shanaih -- "Harinama takes everything away." (Laughter) I wanted to become a very big businessman and there was good opportunity. I was very nicely associated with the chemical industry of India -- Dr. Bose's laboratory, Bengal Chemical, and all of them -- and they liked my business organization. Then I started a big laboratory in Lucknow-those were golden days -- but gradually everything became tainted, and at last my Allahabad business was lost. I had to hand it over to Dr. Chandra Bose because I was his agent. There were some debts, so I told him, "Alright, you take this business." In this way the business was lost. So I was sitting at home, and Yajavara Maharaja -- at that time, Sarvaisnava Brahmacari and Atulananda Brahmacari used to come to sell their subscriptions, and they were requesting, "Why don't you come to our Math, why don't you come to our Math? You are now free." So I used to visit their temple, which was not far away from my house. Then my intimate relationship with the Gaudiya Math began. In this way, I think in 1933...yes, they came to lay down the foundation stone of the Allahabad Math. Maharaja, I think you remember? Srila Sridhara Maharaja: Yes, we were coming from Vrndavana parikrama. Srila Prabhupada: Yes, parikrama. And the parikrama, that is also another intimate story. I was not initiated at that time, but I had a very good aspiration for devotional service, and before 1933 I met Sridhara Maharaja and other devotees-old Tirtha Maharaja-and they were very, very kind to me. So I thought, "What are these people doing on this parikrama? Let me also go." So I met them in Kosi. Perhaps, Maharaja, you may remember that all the people were going to see some Sesasayi Deity. Srila Sridhara Maharaja: Including Puri Maharaja. Srila Prabhupada: Yes. So at that time, later on, Kesava Maharaja informed everyone that, "Guru Maharaja is going to Mathura tomorrow morning, and he will speak Hari-katha this evening. Anyone who wants to remain may remain, or otherwise they may prepare to go to see Sesasayi." So at that time I think only ten or twelve men remained. Out of them Sridhara Maharaja was one of them, and I thought it wise, "What can I see, this Sesasayi? Let me hear. Guru Maharaja will speak; let me hear." Srila Sridhara Maharaja: It was better to listen to him than to have the eye- experience. Srila Prabhupada: Because we could understand that he is a Vaikuntha person and we were always eager to hear, he very much appreciated that. So when he came back to Allahabad, Golesh Babu introduced me to him saying, "Here is a nice devotee." Prabhupada immediately replied, "Yes, I marked that he does not go away. He hears very well. Yes, I will accept him." Then I was initiated. In this way my relationship with Gaudiya Math developed, and gradually as it developed, the other [family and business] side diminished. Srila Sridhara Maharaja: ...as a sannyasi. Srila Sridhara Maharaja: There was one house...a very small place. Srila Prabhupada: He wanted to rent from us only for 90 rupees. I told him, "Please give the contract," because my friend at that time was getting some more. But because I was his friend, "Alright, then give me...." Anyway, that could not happen somehow or other. But I was trying [to assist] from the very beginning after the disappearance of Srila Bhaktisiddhanta Saraswati. Srila Sridhara Maharaja: At that time you published Back to Godhead. Srila Prabhupada: Yes, in 1944. Srila Prabhupada: I think that you were at that time at my house. Srila Prabhupada: So somehow or other this intention for preaching the cult of Caitanya Mahaprabhu increased, and the other side decreased. I was not disinclined, but Krsna forced me, that, "You must give up!" (Laughter) These things are known better to Sridhara Maharaja-how it decreased, decreased, decreased...then, it became almost nil. Whatever was there: "Alright, you give up your [grhastha] life in 1954." Four years I remained as vanaprastha-almost four years-between 1954 and 1959. Srila Sridhara Maharaja: In the meantime, Bombay life. Srila Sridhara Maharaja: ...big sum. Srila Prabhupada: Big sum, yes. So Goswami Maharaja appreciated and began to speak highly about me, that "Abhay Babu is so expert, and he has so many friends, and he has collected something. So why should he not be in charge of the Math?" In this way, "Why should he not be with us? Why is he living separately in this way?" So Prabhupada said to me-Sridhara Maharaja remembers-he said, "I think it is better [for you] to live separately." [And he said to the other devotees:] "Let him live separately and he'll do the necessary in due course of time." I could not understand what Srila Prabhupada meant by that, but his blessings were always upon me, although I was unfit. He was so kind. Srila Prabhupada: Yes, Prabhupada gave me some money. He was afraid, so: "You take this money. When they need, you can give." So by guru, Vaisnava -- whatever position I have got, it is by guru's mercy and the Vaisnavas' blessings; otherwise I am insignificant. So I wish that Sridhara Maharaja may bestow his blessings... (to Srila Sridhara Maharaja:) ...as you are doing always... and that my Guru Maharaja may help me, if I can give some service. 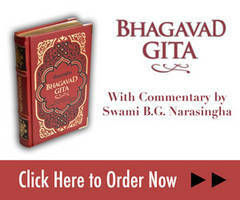 Srila Sridhara Maharaja: Remember... some dissertation of Bhagavatam at Radha-Damodara on Jiva Goswami's [appearance] day? Srila Prabhupada: Yes, Jiva Goswami. Srila Sridhara Maharaja: That gave you that last impression which you told about and the possibility for foreign [preaching]. Srila Prabhupada: And Guru Maharaja wanted that, yet those Gaudiya Math people did not do anything. So: "Let me try in this old age in a special camp," and I went [to the West] by his grace and it has become a big success. But I have no credit. It is all the blessings of guru and Vaisnavas, that's all. I have no credit. I do not know how things are happening because I am not at all in a bona fide position. I did it through tadiya vaisnava seva nistha. Srila Prabhupada: ...I wish to say [to America]: "Taking care of your position is very good. Now, if you take to Krsna consciousness and you become a perfect nation-that I see coming by the grace of Krsna. You have already got all material opulences; now make it plus Krsna, and then it will be great. Laksmi plus Narayana." So these boys are trying very sincerely and seriously, and I hope that even if I do not live many more years, they carry out this order. Srila Sridhara Maharaja: We are in that current, so we are also counted within that current. Srila Sridhara Maharaja: Current is there, so it will be done. It will be done. Hare Krsna, Hare Krsna. Srila Prabhupada (to the devotees): So, chant Hare Krsna.